It looked like the CBC had come to town. The interviewer studied her questions. The sound man ran a voice check. The cameraman secured his tripod in sand that was like sugar beneath our feet. But this wasn’t prime time television. We were in Trout Lake, Northwest Territories, a hundred kilometres north of the British Columbia border. 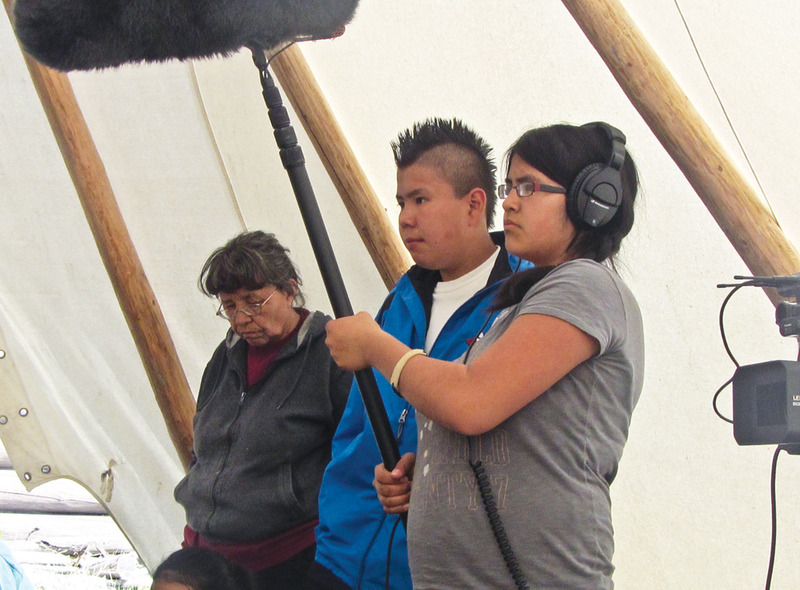 The camera crew was made up of a dozen Dene children between the ages of six and sixteen. They were interviewing two elders, Edward Jumbo and Joe Punch, about the day, 35 years before, when Judge Thomas Berger visited Trout Lake. Students’ video workshop, Trout Lake, NWT. Photo by Peter Gorrie. Students’ video workshop, Fort Simpson, NWT. Photo by Esmeralda Antoine. 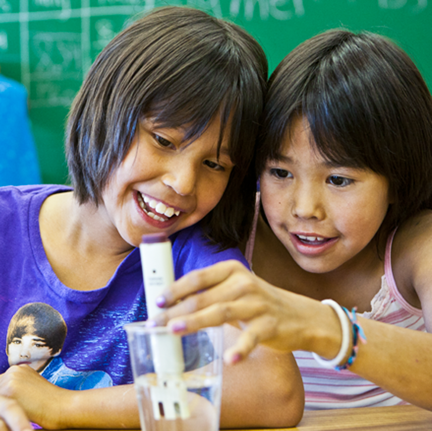 This experiment in hands-on history was organized by Brian Jaffray, the Math, Science and Social Studies Teacher Consultant for nine remote schools of the Dehcho Divisional Education Council. 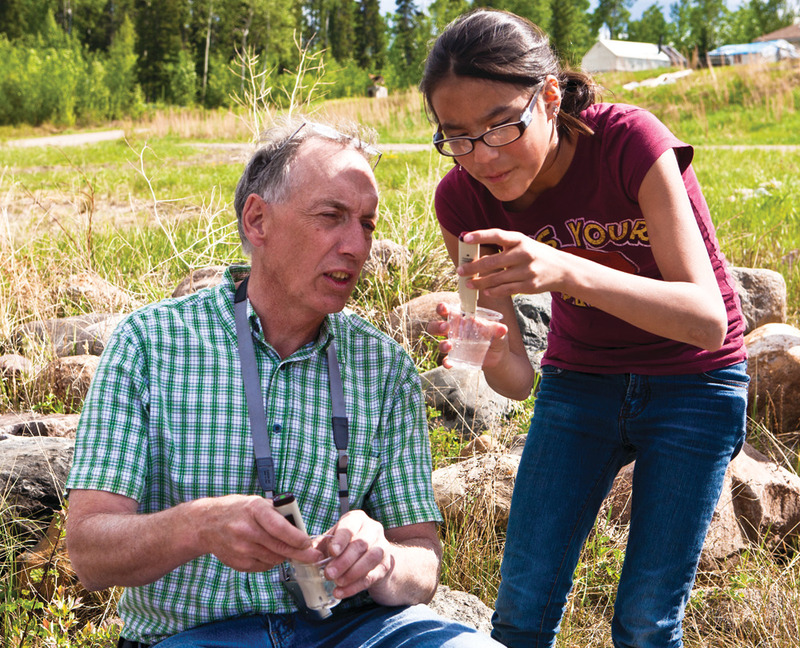 As President of the NWT Historical Fairs Society, Brian has spent a decade encouraging children to conduct research projects on northern topics. 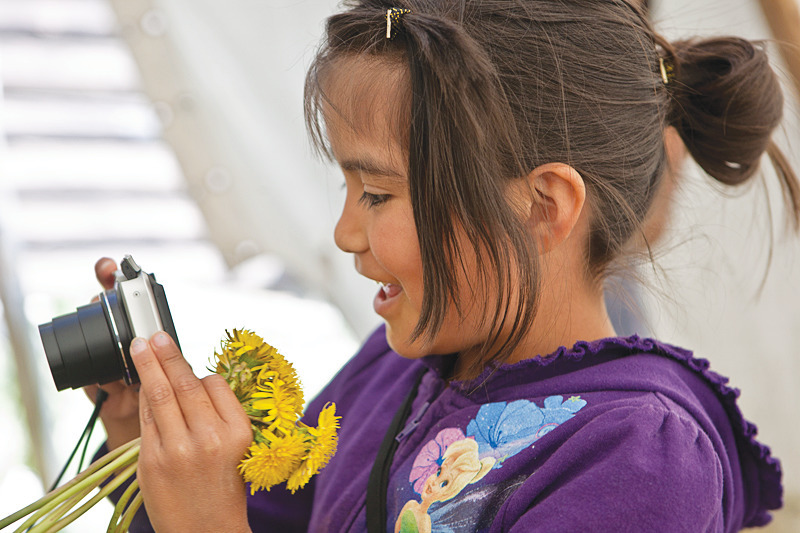 Children in the north don’t always have access to print or Internet resources with reliable information about their traditional culture, so Brian dreamed of putting together an Education Archive with photos and first-person interviews. 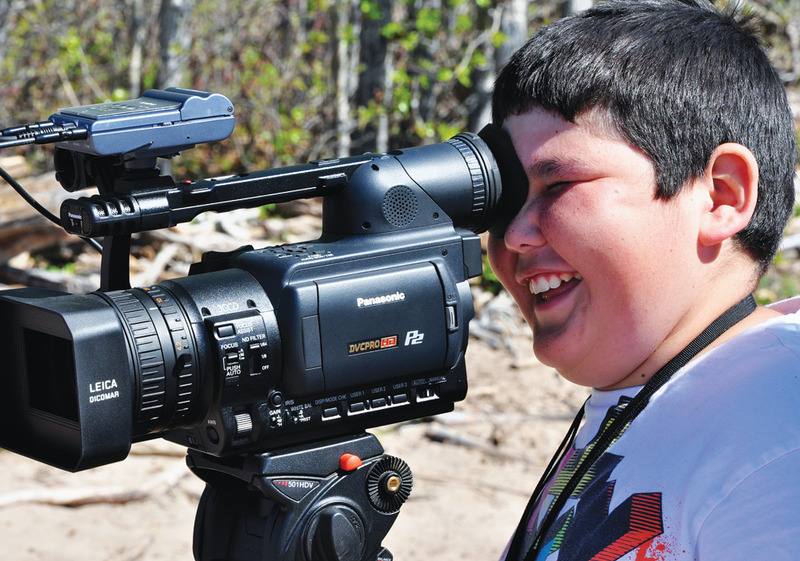 Students’ video workshop, Fort Simpson, NWT. Photo by Linda MacCannell. Coincidentally, a group of us in the south had been working on a parallel project. We had all been involved in a watershed event in northern history: the Berger Inquiry. From 1974–76, we accompanied Justice Thomas Berger as he conducted hearings into the largest engineering project ever proposed in Canada, a pipeline that would bring natural gas from the Beaufort Sea, down the Mackenzie Valley to southern markets. His hearings were a radical break with tradition. Instead of restricting himself to evidence from the two competing pipeline companies, the judge invited environmental and aboriginal organizations to present testimony as well. He also visited thirty communities along the pipeline route, hearing testimony in English and six aboriginal languages. News coverage from the inquiry piqued the interest of southern Canadians. The judge’s final report was an overnight success literally. Ten thousand copies sold on the first day alone. Those of us who worked on the inquiry—as staff, witnesses and reporters—have stayed in touch over the intervening years. In 2008, we began building an archive of our photographs, audiotapes and film clips, fearing they would disintegrate or disappear. When Brian Jaffray heard about our archive, he invited us to travel along the Mackenzie River, by freighter canoe, truck and float plane. We would stop at nine village schools and show our media from 1976. Then we would give workshops in photography, sound and video, so that the students could conduct their own interviews with elders who had spoken to the judge. In May, 2011, six of us arrived at the Fort Simpson airport, laden with photographs and newspaper clippings. With the ice still melting on the river, we began the journey. Michael Jackson was the star of the tour. In 1974, he was named Special Counsel at the Berger Inquiry, responsible for organizing hearings in villages all along the Mackenzie. For two years, he travelled to fish camps and trappers’ cabins, inviting people to speak to the judge. To illustrate the hearings, Michael carried a tiny, handheld projector and slides taken at previous hearings. Now, almost forty years later, Michael was showing his slide collection to the grandchildren of those original hunters and trappers. News of the slideshow travelled quickly and, throughout the day, elders would drop into the school to see the photographs. These conversations were bittersweet because the slides were often the only existing image of a family member who had died long ago. Now that Michael’s collection has been digitized and placed in the Education Archive, northerners will be able to see the slides online any time they wish. Elizabeth Hardisty was a researcher with the Dene Land Use study in 1975. She conducted interviews with hundreds of Dene hunters and trappers, drawing their traditional trails onto huge maps. The finished study was presented to Judge Berger as the underpinning of the Dene land claim. During our river journey, Elizabeth handed out maps and little cut-out animals, so children could mark their own animal sightings. In Fort Simpson, a class of 35 Grade Two students had spotted 170 animals in the previous year. As a young man, Peter Gorrie was a reporter for the News of the North in Yellowknife. He later became the senior reporter covering environmental issues at the Toronto Star. When we reached Fort Liard, Peter organized a “Press Conference” so high school students could interview Harry Deneron, who had been a young chief when Judge Berger visited. We trained four groups of teenage journalists: writers, photographers, television and radio reporters. They were more than happy to put the Chief on the hotseat. The press conference continued until the final bell rang. Suddenly, students realized they had forgotten to ask Deneron about the thorny issue of pipeline jobs. They ran out to the parking lot, drew Deneron back to the classroom, and continued asking questions. Throughout the river journey, Brian Jaffray was our “go to” guy. If we fell ill, he found medicine. If a computer broke down, he fixed it. He even rewired the school in Fort Providence so students could interview Thomas Berger via Facetime. But those activities left Brian with little time to teach. That changed when we reached Wrigley. In 1975, Sarah Horesay told Judge Berger of her fear that a break in the natural gas pipeline would endanger the natural beauty of the village. Ironically, only days before we arrived in Wrigley, an oil pipeline near the community did rupture, saturating land used by migrating birds and leaking into a tributary of the Mackenzie. River. Photo by Linda MacCannell. In Wrigley, Brian invited students to discuss Sarah Horesay’s speech. Then they went down to the river and collected water samples. Back in the classroom, they tested the water and debated the effects leaked oil might have on the land and wildlife. The workshop was a seamless mingling of history and science. 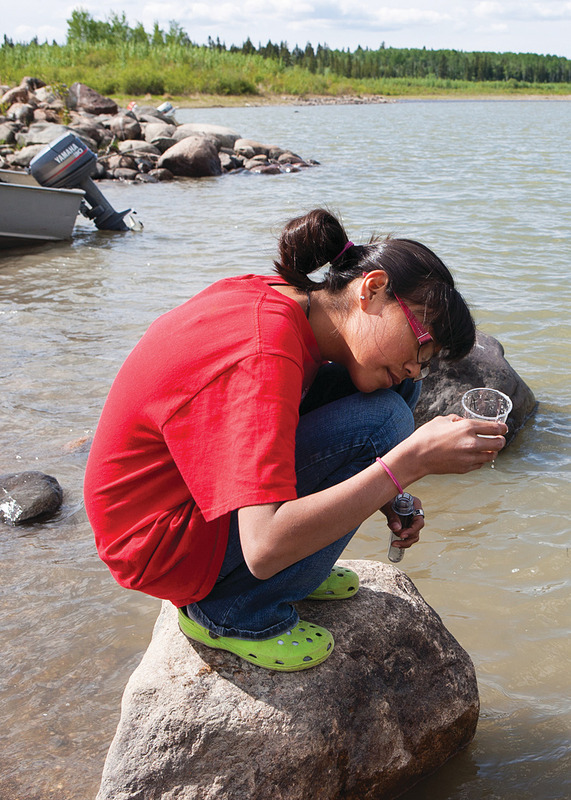 Wrigley student collecting water samples from the Mackenzie River. Photo by Linda MacCannell. On May 9, 2012, the veterans of the river journey will meet again in Yellowknife, to celebrate the 35th anniversary of the Berger Inquiry report. We will use the occasion to launch a website that combines Michael Jackson’s stories and the work of students from across the Dehcho. Visit www.pwnhc.ca/research/berger/. Wrigley students test water samples. Photo by Linda MacCannell. From 1975-77, Drew Ann Wake covered the Berger Inquiry for the CBC and the National Film Board. In recent years she has produced the educational computer games Missing, Mirror Image and AirDogs.